The Rosette Nebula is a beautiful molecular cloud of hydrogen gas that resembles a Rose. 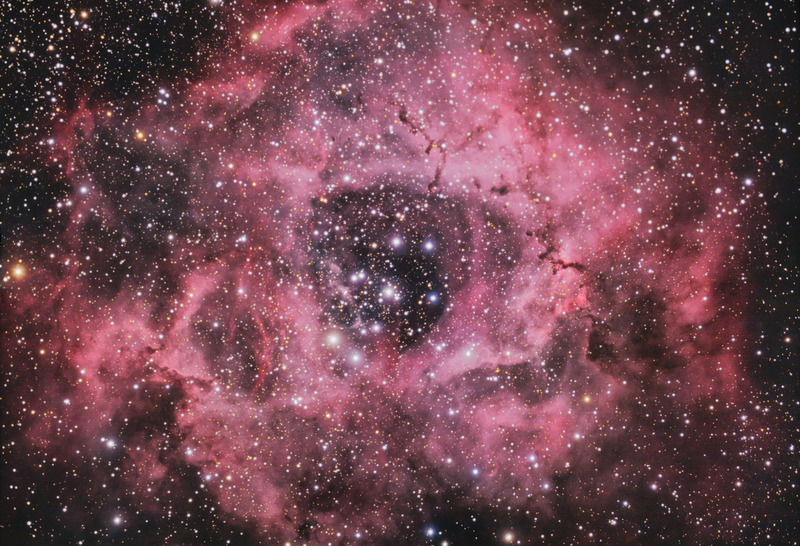 Within the nebula is the newly formed star cluster NGC 2244. The nebula itself is estimated to have a mass equivalent to 10,000 Suns. In this image, North is Up. This image is a mosaic consisting of 4 frames and is 147% the size of a single full frame. Software Used Images Plus 4.5 for camera control, calibration, and stacking. Images Plus 5.0 for digital development, multiresolution sharpening, smoothing and noise reduction. Photoshop CS5 used for levels and curves, color correction, high pass filter, star shrinking, saturation adjustments, lab color, selective color, and screen mask invert. Gradient Xterminator for gradient removal. Carboni Tools for additional saturation adjustments, noise reduction, and smoothing. HLVG for additional color correction. Registar for aligning stacks. Notes This is my first mosaic, and I was quite happy with the blending of the panels. When capturing the images, I wasn't particularly careful about aligning the camera in the same orientation from night to night, so I missed capturing the entire nebula. Nonetheless, I think the overall image came out fairly well. The high resolution version displayed here is not the full frame. The full resolution version is available here.